This June, I flew to Kwajalein Atoll in the Marshall Islands as part of an ALLIES pilot project facing the Pacific. I collaborated with two midshipmen from the U.S. Naval Academy to study the effects of climate change on U.S. national security. A component of the project was evaluating living conditions, resources, and infrastructure on the two main islands. The first was Kwajalein Island, home to U.S. Army Garrison Kwajalein Atoll and about 1,000 Americans. The second was Ebeye, the second most populated island in the country with a population of about 18,000. Kwajalein Atoll was discovered by Spanish explorers in the mid-1500s and was controlled by Spain until Imperial Germany bought the islands after the Spanish-American War. Japan seized the territory during the First World War and was given a League of Nations mandate to administer it shortly thereafter. Japan militarized the islands in the run-up to the Second World War, and the U.S. seized the Atoll using Marine and Army divisions supported by the Air Force. Since then, the United States has administered the territory as a UN trust. Up until the 1960s, the Marshall Islands were used for extensive nuclear testing, and Kwajalein Atoll remains a premiere missile test site for the U.S. The Republic of the Marshall Islands (RMI) became a sovereign nation in 1986 under an agreement which allowed for an extended lease of the U.S. military installations on Kwajalein Atoll. The payments that the U.S. has paid as part of this agreement and as part of the broader Compact of Free Association, contributes to the economic stability of the country. Even before I landed in the Marshalls, the sheer isolation of my destination was apparent. It took seven hours of flying from Honolulu to get to Bucholz Army Airfield on Kwajalein Atoll, a chain of islands that is equidistant from Japan, Australia, and Hawai’i. Landing on the island that was barely larger than the runway is a memory I'll never forget. A signpost next to the airfield listed distances to various locations. The closest was Wake Island, a mere 637 miles away. Everywhere else was listed in thousands of miles. The U.S. Army base that hosts the airfield is a self-contained cross-section of America. There are schools, a post office, a Burger King, and a Subway. The entertainment options include pools, a scuba club, a yacht club, and a fishing club. If you ignore the fact that the island is in the middle of the South Pacific, it could be a small town in California or Florida. Goods and produce are very limited since the only food source are the scheduled Air Force C-17 flights, but then again, C-17s are large planes. The only way of getting from the base to Ebeye was a 20-minute Army ferry ride. The differences between the two islands are obvious the minute one steps on to Ebeye. The streets are barely paved, with standing water and trash in the streets. 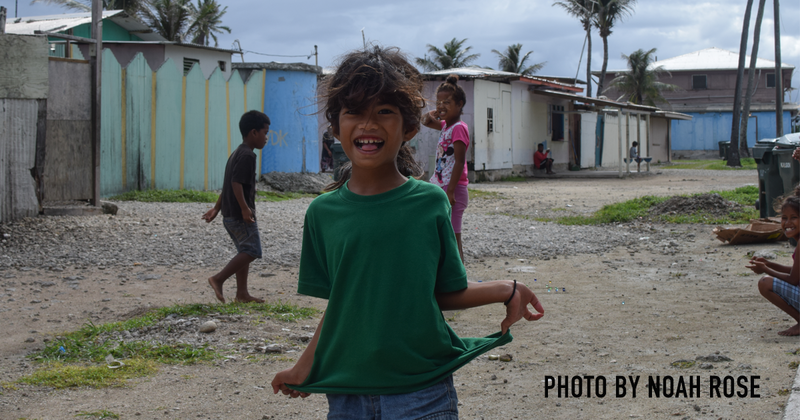 With an average of nine people per household, Ebeye has a population density approximately three times that of Manhattan, although Ebeye doesn’t have any buildings taller than two stories while most are only one level. Many houses don’t have running water; water is gotten by walking to and from a filtration plant. Electricity is available, but unreliable (there were two blackouts my first night there).